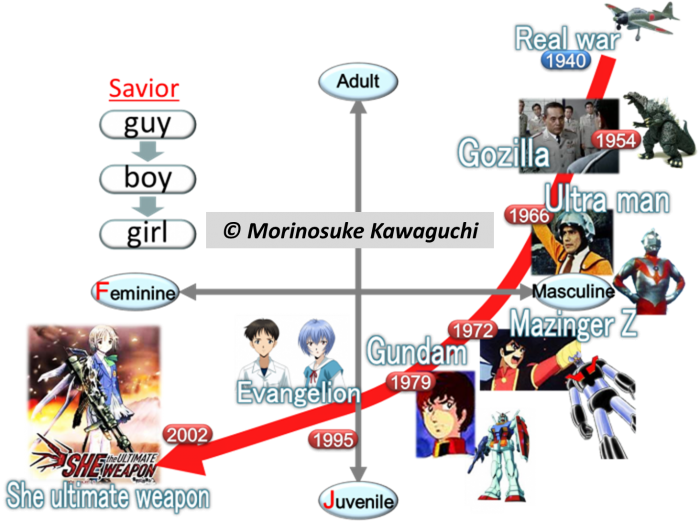 Using Morinosuke Kawaguchi’s four quadrant matrix to assess mentality dimensions, Japanese heroes are moving towards the lower left corner, towards the girly dimension. It’s not surprising, since history has seen many cases where society’s orientation was towards the young and feminine, especially during extended periods of (relative) peace. The rise of the metrosexual man is but one example. What about our main orientation points and role models? No matter the culture, people always have their heroes. And if you compare the heroes in movies or on TV from 50 years ago to the ones shown now, you will see a transition from the mature, rational, tough guy towards increasingly younger and increasingly female protagonists. In one of the most popular anime series of all time, Neon Genesis Evangelion, the 14-year old boyish hero is a weak-spirited wimp compared to the other two female protagonists. He saves the world nevertheless. And the latest world savior is SHE – the ultimate weapon. While you might think this is exclusive to the world of entertainment, think about how deep an impact heroes have in our life, even later when we’re adults. But this development permeates cuture and society, and as such it permeates how we create images. According to Kawaguchi, the manga hero is the best indicator for the future sense of value, and the best object to benchmark the future.